The OURLINK 600Mbps 802.11ac Wireless Network Adapter is our best USB Wi-Fi adapter, which is an 802.11ac dual band adapter that can allow you to play games without lag. 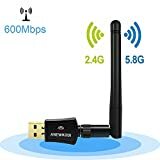 If you want to upgrade the Wi-Fi of your computer then you can use this USB Wi-Fi adapter with its omni-directional dual band antenna and the versatility of 2.4G/5G networks. Our step-up pick is the BrosTrend 1200Mbps USB Wireless Internet Adapter and this USB Wi-Fi adapter can give you amazing speeds for your online gaming needs and it can be positioned horizontally and vertically due to the adjustable antennas. It also has gold plated parts for faster contact and data transfer, which is great for streaming 4K videos and the like. The budget pick is the ANEWKODI 600Mbps Dual-Band USB Wifi Adapter and it does not disconnect and has a long range 2dBi antenna that is enough for your needs. The USB Wi-Fi adapter works on 802.11ac for any laptop or desktop. It allows you to connect with speeds of up to 433 Mbps on 5G Hz or 150 Mbps on 2.4 GHz and it is quite simple to install. USB Wi-Fi adapters or USB dongles / Wi-Fi dongles are simply devices that let you have internet connection in any computer. If your motherboard doesn’t have a wireless network adapter or Wi-Fi adapter, you will need to buy a USB Wi-Fi adapter. A USB Wi-Fi adapter is made for computers that do not have a Wi-Fi or wireless adapter, such as old desktops/towers and older laptops and notebooks. The purposes of a USB Wi-Fi adapter is to get internet connection without the use of an Ethernet port. In the same way, if you found out that your built-in wireless adapter in your laptop, notebook or desktop/tower is broken, not functioning well or very slow in terms of signal (and you’ve figured out that it’s not your ISP’s fault), you can buy a USB Wi-Fi adapter as well. A USB Wi-Fi adapter does the job of keeping your internet connection intact without having to carry additional wires. A USB Wi-Fi adapter is very portable such that it won’t clutter up your notebook, laptop or desktop/tower. In the same way, if your computer doesn’t have a built-in Wi-Fi adapter yet, you can buy a USB powered one. The hassle-free benefit of simply connecting through the internet with a USB powered Wi-Fi device adapter makes it easy to travel and connect to the internet anytime and anywhere without the use of wires. To know the USB Wi-Fi adapter that your computer accepts, you need to know its type of USB Wi-Fi adapter by reading the user’s manual or online manuals and guides. The fastest today is the 802.11ac but you can still get the 802.11a/b/g/n and 802.11b/g/n types of USB Wi-Fi adapters today, usually cheaper than the ac type. You can simply look at your type of USB Wi-Fi adapter by going to the device manager of your computer and checking the properties of your network adapter (It’s usually a Qualcomm Atheros for Windows computers). When you are choosing a USB Wi-Fi adapter, make sure that it is compatible with your router with the right speed. If your USB Wi-Fi adapter is a 802.11ac, make sure your router also supports 802.11ac, otherwise just stick with the b/g/n family adapters. USB version also plays an important role in speed. If you have a laptop or computer with USB 3.0 and your adapter also uses USB 3.0 then it will speed up your wireless internet connection. The goal of a USB Wi-Fi adapter is to provide you with wireless internet connectivity even if your laptop or computer doesn’t have an adapter and you don’t have a cable to connect to a router nearby. The USB Wi-Fi adapter can support up to 10 connections all at once so it can also be great for mobile businesses such as food carts and even while making business deals, meetings and presentations over at Starbucks. As long as your computer has a USB port, the USB Wi-Fi adapter can work on just about any kind of computer, whether it’s a Windows 95, 2000 or XP from the 90s or something you’ve salvaged from your basement (and belonged to your parents or grandparents). The purpose of a USB Wi-Fi adapter is to enable wireless connection between the computer and your router even without the use of wires. In the same way, if your computer’s Wi-Fi adapter is broken, no longer working or slow, you can replace it with a new USB Wi-Fi adapter. After all, external gadgets last longer than internal gadgets due to ventilation. Your dad or grandpa might argue that a USB Wi-Fi adapter is not as fast as connecting with an Ethernet cable directly to the modem or router. While this is right, it doesn’t necessarily mean that a USB Wi-Fi adapter can’t be fast enough. Today’s technology allows the USB Wi-Fi adapter’s speed to expand even more due to the demands of wireless systems. However, if you’re in an emergency situation (e.g. your Wi-Fi adapter fails to work), you can always have an Ethernet cable to connect to the internet directly as an alternative solution. A Wi-Fi adapter is not always USB powered. For instance, you have the traditional way of connecting to your wireless router using an Ethernet cable (mostly for consoles today). The PCI adapter is made for desktops while Mini PCI and PCMCIA are used for laptops and notebooks. You can explore the different kinds of wireless adapters and choose the one that is appropriate for your computer and router as well as internet speed. Since a USB Wi-Fi adapter uses power from your computer, it is advisable that you only use it whenever you need to connect to the internet, if it is a laptop or notebook that depends upon battery power. Otherwise, continuously powered desktops/towers or laptops can just leave their USB Wi-Fi adapter all the time. On a side note: if your laptop or notebook doesn’t have a lot of USB ports, you may need to buy an additional adapter for it. If you are a first time PC builder and don’t know if you should get a USB Wi-Fi adapter for your system, you need to know if the motherboard of your intended PC has an adapter for wireless connection. If it does not then a USB Wi-Fi adapter is a way to help you get connected over your router wirelessly, without the need for an Ethernet cable. Wi-Fi signals can decrease depending on how many walls you have at home and if your Wi-Fi router isn’t placed strategically. Therefore, it is important that your IT or tech personnel should plan where to place the router carefully to avoid slowing down the internet speed. Not all countries in the world have a good internet speed. Average speeds of 10 to 15 Mbps are only applicable to countries with up-to-date internet technology, as not all countries in the world have the necessary funds to upgrade their ISPs (and most of these ISPs can be stingy with money so no upgrades have been made for millions for customers). Wireless transmission speed: while this is mostly depending on your ISP (Internet Service Provider), a USB Wi-Fi adapter should have a good transmission speed, usually from 150 up to 550 Mbps depending on its technology. You should consider a USB Wi-Fi adapter that is just right for your needs of data transfer and internet speed and should match your ISP speed and router speed. Supported operating system: your USB Wi-Fi adapter may either support all operating systems (Windows, Mac and Linux) or may only support one or two of them. However, the most common ones you’ll see support Windows and Mac OS. USB type: consider a USB Wi-Fi adapter that has a good USB port and it’s best to have USB 3.0 for faster data transfer speeds. While having a USB 2.0 port for your USB Wi-Fi adapter is okay, having a USB 3.0 is better, although not all laptops and desktops today have a USB 3.0 yet, but the good news is that USB 3.0 USB Wi-Fi adapters are backwards compatible anyway. Desktop, laptop or notebook: you should choose the appropriate USB Wi-Fi adapter for your type of computer. It can either be for a desktop or for a mobile computer, such as a laptop or notebook. Different USB Wi-Fi adapters work well for different kinds of computing devices so you should pick the right one for your needs. Wireless adapter type: the USB Wi-Fi adapter can be on the b/g/n/ adapter type or the newer 802.11ac adapter. These types of adapters can have an impact on the range of your wireless network. However, do note that the ac network is a lot more expensive compared to the b/g/n/ USB Wi-Fi adapters and not all of the routers today can have the ac adapter technology supported just yet. Ease of installation: the USB Wi-Fi adapter should have an easy to install method and some are even plug and play USB Wi-Fi adapters that you can easily install without much technical knowledge. This is important if you are not very knowledgeable with IT stuff and simply want a USB Wi-Fi adapter for your desktop or laptop. Intended use: do consider if you want a USB Wi-Fi adapter mostly for gaming, for live streaming, for business purposes or for personal needs. Gamers need a really fast USB Wi-Fi adapter due to LAN games and live streaming over Twitch and similar sites. Our best USB Wi-Fi adapter is the OURLINK 600Mbps 802.11ac Wireless Network Adapter, which is a mini wireless network adapter and it can give you lag-free online gaming all the time. It is a plug and play for most newer Windows systems to make it easy to install. 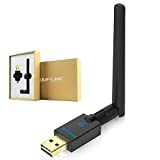 You can use this USB Wi-Fi adapter in an older laptop to upgrade the internet connection for a great performance with its Beamforming+ technology. This is a nice USB Wi-Fi dongle adapter that can reach up to 433 Mbps (5G) and 150 Mbps (2.4G) of speeds and reliability as well. Powered by a 5dBi antenna, the USB Wi-Fi adapter is great for HD video streaming and it allows you to stream videos quickly unlike before. The unit supports Windows XP, Vista, 7, 8.1 and 10 and it suffices the need for higher bandwidth even for mobile devices and the like. The USB Wi-Fi adapter also supports Mac OS X 10.6 to 10.12.4 and can also help you create a Wi-Fi hotspot. What’s more, its dual band reduces interference from appliances like microwave ovens. With a USB 3.0 port for faster speeds, the USB Wi-Fi adapter features powerful Wi-Fi technology. Great for general and faster web surfing, the USB Wi-Fi adapter has sufficient speed and range that is also faster than wireless n speeds. Its antenna is detachable for portability and you can use the USB Wi-Fi adapter for your Raspberry Pi projects as well. Giving you an increased coverage, the USB Wi-Fi adapter is great for gaming online. While not a major con, the OURLINK 600Mbps 802.11ac Wireless Network Adapter can be a bit hard to install on Linux, but this is expected, as most of the market adapters are geared towards Windows and Mac users anyway. The BrosTrend 1200Mbps USB Wireless Internet Adapter is our step-up pick with enough Wi-Fi speed for your needs due to its 802.11 ac technology that is great for HD streaming. It can reach up to 867 Mbps on 5G band or 300 mbps on 2.4G band and it can give you better Wi-Fi connection overall. If you want a USB Wi-Fi adapter for lag-free gaming then this is the USB Wi-Fi adapter to have. It can be used for a desktop or laptop and it can be used for accessing the internet, playing games and shopping online. It also lets you play high quality music anytime and anywhere with good performance. The USB Wi-Fi adapter works with any wireless router and it can help you browse Facebook faster. The signal in your place will also significantly increase whether you’re on a desktop or laptop. It is a dual band Wi-Fi adapter that is USB 3.0 powered as a USB wireless internet adapter. Working on Windows XP up to Windows 10 (32 bit or 64 bit), the USB Wi-Fi adapter is also Linux-compatible with a lot of stability in terms of signal. You get two 5dbi Wi-Fi antennas that give you a high gain and you can make video calls smoothly. Also running on Mac OS X 10.6 to 10.10, the USB Wi-Fi adapter is a long range Wi-Fi adapter and it is also Linux and Ubuntu compatible. With a 5 feet extension cable included, the adapter is also backward compatible with USB 2.0 ports. It gives you extended Wi-Fi connection for your needs. The ANEWKODI 600Mbps Dual-Band USB Wifi Adapter is our budget pick and is an external USB Wi-Fi adapter that has a great range overall for your web surfing needs. It has a powerful antenna and can run on different operating systems to play music and videos with a high gain antenna. 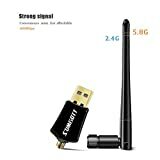 You can upgrade your computer with this USB Wi-Fi adapter and also watch HD videos along the way, even when signals are weak. This unit boosts your speed with its technology and is a plug and play for Windows 10 and higher Windows versions for easy installation. As a high speed USB Wi-Fi adapter, you can position it anywhere and it also installs in minutes as a quick unit that can also reduce lags for when you are online chatting or gaming as well. The USB Wi-Fi adapter is also a great unit to have when streaming your favorite shows or game play through. Applicable for Windows 10, 8.1, 8, 7, XP and Vista and also for Mac OS 10.4 to 10.12.1, the USB Wi-Fi adapter is a great gaming adapter that has a strong Wi-Fi signal that can go even through a wall. The USB Wi-Fi adapter has a setup CD included for ease of installation. With this fast AC600 wireless adapter, you can browse photos and videos on various sites so easily. It is backed by a 12 month warranty. The Panda Wireless PAU09 N600 Dual Band is a dual band USB Wi-Fi adapter that can be switched between 2.4 GHz and 5 GHz to avoid interference. It supports all 802.11 ac/b/g/n networks and it is also great for Linux based systems. It is a plug and play installation so it is easy to use. The USB Wi-Fi adapter can go for up to 300 Mbps for both 2.4 GHz and 5 GHz networks. It can also improve performance wherever you are and it eagerly works with Windows XP to 10, Ubuntu 13.10 to 16.04 and various OS. Giving you a strong signal, the adapter results in a very responsive internet speed. With a total of two 5dBi antennas included, the USB Wi-Fi adapter can significantly improve your wireless connection speeds as the unit gets good reception wherever you are. You also get a backward compatibility with 802.11b/g/n with this USB Wi-Fi adapter. As a dual band USB Wi-Fi adapter that is quite easy to install, you can get a higher connection speed with it even on really tight spaces. It is also made to have a low power consumption so it is okay to use even for laptops that run on battery. If you find it difficult to look for Linux compatible devices then this is the one to get. It is great for desktops and its infrastructure and ad-hoc mode support makes it easy to access your wireless network as well. It also supports Fedora, CentOS, Raspbian, Mint, Ubuntu, openSUSE, Kali Linux and many more. There is no need for configuration on a Raspberry Pi 3 with this USB Wi-Fi adapter. The security encryption supported technologies are WPA2 (TKIP+AES), WEP 64 and 128 bit and WPA. This USB Wi-Fi adapter is backed by a 1 year limited warranty. The NETGEAR Nighthawk AC1900 WiFi USB Adapter is equipped with a magnetic cradle and is applicable for either a laptop or desktop. It has great range and is powered with 802.11ac technology so it is worth the money as a dual band Wi-Fi adapter. You can control your home network with this adapter, whether you are at home or in a workplace. The USB Wi-Fi adapter can help you have lag-free gaming all the time with great speed and you can also monitor and connect due to its additional features. Featuring the best HD streaming possible, the USB Wi-Fi adapter is quite easy to install and is powered by USB 3.0 so it is very fast in terms of data transfer. If your signal is low, this USB Wi-Fi adapter can boost it up using its Beamforming+ technology. This USB Wi-Fi adapter also allows you to get internet on the go and it can reach up to 600 Mbps on 2.4 GHz and 1,300 Mbps on 5 GHz while being backwards compatible with USB 2.0 technology. You can easily mount the USB Wi-Fi adapter on a metal surface due to the cradle. With Mac and Windows compatibility, the USB Wi-Fi adapter has an external antenna for better connectivity and it works with a lot of Wi-Fi routers. As an adapter with flexible placement, you also get efficient data transfer due to the USB technology and Wi-Fi technology which boosts high signals. You get more bandwidth capacity in the long run with this USB Wi-Fi adapter, resulting in a lag-free gaming experience online. This USB Wi-Fi adapter is coupled with a quick start guide. The SUMGOTT 600Mbps Wireless USB WiFi Adapter is an 802.11ac wireless adapter that supports both Windows and Mac OS. 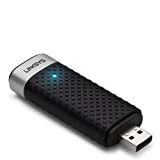 Made for you to watch videos faster and also for online gaming, this USB Wi-Fi adapter has great antenna connectivity at 5.8 GHz (433 Mbps) or 2.4 GHz (150 Mbps) bands. It is a great little Wi-Fi adapter that can significantly improve the speed of the network that you are in. it works with any of the most common Wi-Fi routers today and it is also so easy to install. It has a 2dBi external antenna that is super strong in its connectivity for your online gaming needs. Using its USB 2.0 interface, the USB Wi-Fi adapter can be used on a desktop, laptop or notebook computer to extensively boost your existing Wi-Fi connection. It enables playing games smoothly for you with its 802.11a/b/g/n and 802.11ac technology that is great for seamless HD streaming. As an easy to install USB Wi-Fi adapter, it supports WPA, WPA2, WPS2.0, WFA and WAPI security encryptions for passwords and can significantly improve your internet performance. Made for Windows and Mac OS X, it is great for a motherboard that is not equipped with Wi-Fi capabilities. The USB Wi-Fi adapter includes the user manual for your reference. All you need to do is to install the CD driver to your computer. It is backed by a 1 year warranty. As a USB Wi-Fi adapter that can reach good speeds, the EDUPLINK Wifi Adapter AC 600 Mbps can run for Windows XP to 10 and OS X 10.6 to 10.12 and it is quite easy to install. You can have wireless connection in different rooms with its 2dBi antenna has a high gain and a long range. You will notice a difference in internet speed when you use this USB Wi-Fi adapter with its 5 GHz (433 Mbps) or 2.4 GHz (150 Mbps) bands. You can have faster on online chatting whether you’re on Win 10 or Win 7 and get faster gaming experiences with this USB Wi-Fi adapter with your internet connection. It has an omni-directional antenna so it is great for streaming videos, music and the like. The USB Wi-Fi adapter is a great alternative if you don’t have a Wi-Fi Adapter for your computer. It is a perfect adapter for speeding up web surfing and for browsing photos and videos. Powered by USB 2.0, it can run on most computers without issues and can enhance the streaming of HD videos. You get network security with its WPS, WEP, WPA2, WPA-PSK and WPA2-PSK encryption capability. It is backed by a 2 year warranty. If you want the best USB Wi-Fi adapter for online video streaming of HD videos, you can count on the Martha MSRM 916AC Wireless Adapter 600Mbps with its 802.11ac with b/g/n backward support compatibility. It has different peak speeds: 5 GHz at 433 Mbps and 2.4 GHz at 150 Mbps. Being quite easy to install, the USB Wi-Fi adapter is a great upgrade for an old computer and its Beamforming+ technology helps you to enhance the overall upload and download speed. Looking good in any wireless network, the USB Wi-Fi adapter helps to boost the general speed. 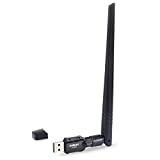 You can easily connect to a wireless network with this USB Wi-Fi adapter that is dual band to avoid interference and get a very good range with its 2dBi antenna. The USB Wi-Fi adapter supports encryption types of WPS, WPA, WEP and WPA2 and it can give you more bandwidth as well. Perfect for your HD video streaming needs, the USB Wi-Fi adapter is a great companion to have in the basement due to its strong signal. In addition to that, installation is simple with the use of this USB Wi-Fi adapter so you do not have to be a tech expert to install it. You can use its high gain antenna for your signal boosting needs as a USB Wi-Fi adapter. It is also ideal for gaming so you can experience a lag-free gaming time whenever and wherever you reside. With a lot of range and reliability, the USB Wi-Fi adapter is greatly compatible with a laptop or even desktop. If you want a USB Wi-Fi adapter that works flawlessly, you can depend on this unit’s Wi-Fi technology to help you connect through the wireless network anytime and anywhere. The durability of this unit makes it not likely to be damaged due to the design. There is an included CD driver for your convenience of installation for this USB Wi-Fi adapter. The U-Tote 600Mbps Wireless USB Network Adapter helps you to enjoy dual band performance and also lets you use the Soft AP mode (Wi-Fi hotspot). It can give you with up to 433Mbps on 5 GHz or 150 Mbps on 2.4 GHz as a USB Wi-Fi adapter with a lot of stability and reliability. 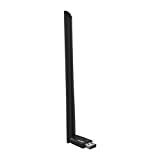 Giving you a very simple setup, the USB Wi-Fi adapter presents a high gain antenna for faster connections that goes through walls or floors. This is important if you have limited space in the office or at home. You can also experience lag-free gaming with this USB Wi-Fi adapter. Attuned to the latest wireless standards, this particular USB Wi-Fi adapter is quite easy to use and setup and is perfect for your HD video streaming needs. If you want to improve your desktop, notebook or laptop for its Wi-Fi connection then this 802.11ac adapter is probably a great thing to have. With its user-friendly configurations, the USB Wi-Fi adapter features a better wireless connection for your computer with its dual band technology that produces lighting speed connections with a better range overall. You will discover that your network will become less congested with it. Great for extending your wireless connection, the included 2dBi external antenna is adjustable. The driver CD and installation guide are both easy to install. This USB Wi-Fi adapter is compatible with Windows XP to 10 and Mac OS 10.4 to 10.12 versions. If you want a compact adapter then you can go for the Linksys Dual-Band Wireless-N USB Adapter AE300, which supports Windows XP up to 8. This USB Wi-Fi adapter allows you to share photos faster and can run on either 2.4 or 5 GHz as a dual band adapter. Running on WEP, WPA, WPA2 and WPS security encryptions, the USB Wi-Fi adapter adapts to the latest 802.11a/b/g/n standards for faster online games and browsing whether you are on a desktop or notebook or laptop computer. With quality WPA2 security, you can setup in minutes with this unit. 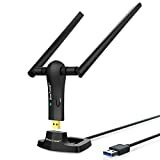 Streaming HD videos will be a breeze with this USB Wi-Fi adapter and its full antenna array for a faster speed in internet connection. As a dual band adapter to give you a better range, it runs on a USB 2.0 port so it is compatible with most computers old and new. With sufficient speed and range powered by its high quality 3×3 antenna, the USB Wi-Fi adapter is a great adapter that also uses multiple antennas. You can enhance your online gaming experience if you configure this USB Wi-Fi adapter to your old computer of any kind and of any age. Reaching speeds up to 450 Mbps, the USB Wi-Fi adapter is simple to setup due to the included installation CD. You can also be connected to Wi-Fi hotspots with this unit while you avoid interference as well. It also reduces dead spots and has a 1 year hardware limited warranty. Other USB Wi-Fi adapters were not very effective when it comes down to internet speed and were also a bit of a fuss to install. Regardless of your ISP’s internet speed, you should consider a wider range and truly effective USB Wi-Fi adapter that is easy to use and install and that really works. Q: What is a USB Wi-Fi adapter? A: A USB Wi-Fi adapter , also called a Wi-Fi adapter or Wi-Fi dongle, is a kind of device that connects to your computer via any USB port and gives you internet connection. Q: How can a USB Wi-Fi adapter benefit me? A: A USB Wi-Fi adapter has many benefits. For instance, it doesn’t require you to have connecting cables, which is essentially important in today’s wireless world, especially if you are using a laptop. USB Wi-Fi adapters are so portable and small that you won’t even recognize they’re connected. Q: What are the different kinds or types of USB Wi-Fi adapters out there? A: A USB Wi-Fi adapter can come in a wide variety of types. The fastest today is the 802.11ac type, followed by the 802.11a/b/g/n and the 802.11b/g/n types. Different laptops and computers may have one of these as a USB Wi-Fi adapter so it is important to read the user’s manual of your laptop or computer to know what kind of USB Wi-Fi adapter it accepts. Q: What dictates the speed of a USB Wi-Fi adapter? A: A USB Wi-Fi adapter can have different speeds depending on the type that you have. The 802.11ac is the fastest today, but do note that you need a router that is capable of that kind of technology, which can reach up to 1,300 Mbps. The b/g/n family can reach only up to 450 Mbps, but they are still available today. The USB version also dictates the speed, such that USB 3.0 is faster than USB 2.0 ports. Q: How much simultaneous connections can a USB Wi-Fi adapter support? A: A simple USB Wi-Fi adapter can support an average of 5 to 10 wireless connections so it is great for portability and compact needs when you often work on the go and need internet connection wherever you are. Q: Does a USB Wi-Fi adapter require you to upgrade your computer? A: No, the USB Wi-Fi adapter can be used by almost any computer with the supported USB port. Even those computers that are still running Windows XP (or older such as Windows 95 or 2000) can still get a USB Wi-Fi adapter to adapt to today’s standards of connecting wirelessly. Even your old beat-up tower computer from the 90s can surf and open Facebook from a wireless router with the help of a USB Wi-Fi adapter at hand. Q: Is there a certain disadvantage to using a USB Wi-Fi adapter? A: Most people agree that nothing beats a wire connection over a wireless one. While nothing can replace the Ethernet cable when it comes to solid communication, a USB Wi-Fi adapter is still very useful because of today’s growing technology in wireless systems. Q: Aside from the USB Wi-Fi adapter, what else kinds of other adapters are there? A: A Wi-Fi adapter can come in a variety of types other than being USB powered. The most traditional one is the PCI because it came with desktops or tower computers. The PCI wireless adapter is usually built-in with the motherboard. Some computers may also have Mini PCI and PCMCIA, especially notebook computers, due to the size. A compact flash adapter is mostly used for pocket PCs. Last but not the least, the good-old Ethernet port is for connecting using an Ethernet cable, and is still used today for consoles such as the PlayStation and Xbox. Q: Where does the USB Wi-Fi adapter draw power from? A: Like all USB powered devices today , a USB Wi-Fi adapter grabs its power source from your computer’s power. This is why it should only be used sparingly if you’re on a laptop that still has a battery powered system (and the battery isn’t broken or disconnected yet). On the other hand, USB Wi-Fi adapters are great for desktop or tower computers due to the unlimited source of power. Q: If I am building a PC from scratch, do I really need a USB Wi-Fi adapter? A: PC building can be intimidating when it comes down to network connectivity. However, that depends on your needs of connectivity because a USB Wi-Fi adapter is only used if your computer’s motherboard does not have a wireless adapter. Most motherboards may have a built-in wireless adapter today but for older motherboards, you will need a USB Wi-Fi adapter if you need to connect it via Wi-Fi. Q: How is 802.11ac better than older Wi-Fi adapter technologies? A: Using 802.11ac for your Wi-Fi adapter makes your bandwidth better, improves internet speed, stability and other things. The fact that it uses dual band technology means that it is significantly higher in technology and standards than the b/g/n networks and interfaces back then. However, the 802.11ac is still pretty expensive today. Q: How are 802.11b, g and n adapter types different from each other? A: The b/g/n adapters are only different when it comes down to their indoor and outdoor range and the date of their technology. 802.11b is the oldest, followed by 802.11g and 802.11n, and the newer the technology, the faster they are and the wider the indoor and outdoor range. Q: What is the advantage of USB 3.0 over USB 2.0 for a Wi-Fi adapter? A: A USB 3.0 port or connection is significantly faster than USB 2.0 due to the data transfer speed. USB 2.0 can transfer up to 480 Megabits per second while USB 3.0 can go for up to 4.8 Giga bits per second, which is needed for today’s technology such as 4K Ultra HD videos and movies. Simply put, streaming things on YouTube will be faster if you have a USB Wi-Fi adapter with a USB 3.0 interface and you have a USB slot on your computer with a USB 3.0 interface. Q: Can a microwave oven affect your Wi-Fi signal? A: Yes, the 2.4GHz frequency band of a microwave oven can distract your Wi-Fi’s signal strength, so you should not always use the microwave if you’re downloading something over the internet. There are also special tools that can keep your wireless internet connection on a certain band, such as the 5 GHz band, to keep it away from the interference of the microwave oven. Q: Can wireless speed be affected by physical obstructions? A: There is a saying that the farther you are from the router, the less speed you get. Yes, Wi-Fi signals go through the air but they don’t really always completely go through the walls like a ghost. Q: Can the computer processor also have an effect on internet speed? A: Yes, processor speed may also play a role on your internet speed. This is why even if you have a fast speed on your laptop, your old Windows XP desktop might not catch up and may load Facebook so slowly. This is because your desktop might have a slower processor than your laptop does. Q: What is network congestion? A: Simply put, network congestion refers to the peak hours of the day where so many people are browsing the internet at the same time. Usually, it’s around the afternoon where most people came home from work or parents are waiting for their students to get home. Most of these users access social media sites like Facebook and this kind of phenomenon can create a network congestion, which may temporarily slow down your internet speed. Q: What typical speed can I get from the different Wi-Fi adapters out there? A: The common speed you can get from the 802.11b standard is up to 3 Mbps, 802.11g can give you up to 20 Mbps, 802.11n can go for up to 50 Mbps and 802.11ac can reach up to 100 Mbps. Q: Why should I move closer to the Wi-Fi router? A: The proximity of the Wi-Fi router gives you more speed. You can buy a repeater to extend the signal of your Wi-Fi router if you are not totally satisfied with its current speed or have a pretty large house or work area. Q: Aside from microwave ovens, what else home devices can interfere with my wireless signal? A: If you have baby monitors , cordless phones and cordless anything that runs on the 2.4 GHz frequency will most likely have an impact to your Wi-Fi signal. Q: Why do some countries have very low internet speeds and why do some have high internet speeds? A: It depends on the density of the population as well as the ISPs that are residing in the country and the laws governing the ISPs. South Korea has the fastest internet speed (over 20 Mbps in the average) in the world because they have a lot of fiber optic technology at an affordable price. Certain countries in Asia and Africa are still in decline because there is a lack of technology and correct pricing for the ISPs so some end up only have an average internet speed of 3 to 5 Mbps. As a whole, we think that the OURLINK 600Mbps 802.11ac Wireless Network Adapter is our best USB Wi-Fi adapter due to its omni-directional 2-band antenna, choice of 2.4G or 5G for no interference and compatibility with Windows, Mac and other operating systems.